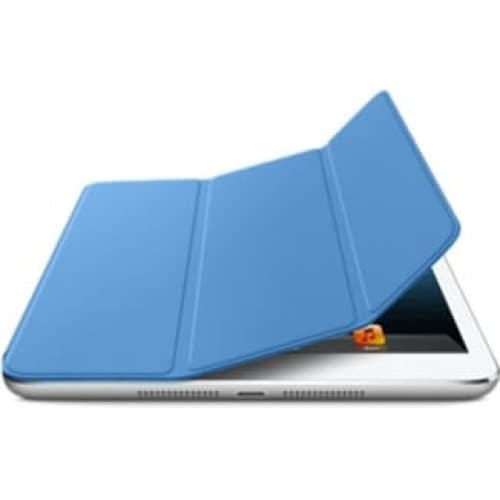 The blue iPad mini Smart Cover provides the same features and functions that the original Smart Cover did for previous versions of the iPad. Ostensibly, this polyurethane cover protects your mini's 7.9" screen from dust, dirt and fingerprints. However. as you explore its capabilities, you'll see it also bolsters the enjoyment you'll get from your computer. To use, merely fold the cover back as you might fold the page of a book. It's that simple. The cover is held by magnets that not only secure it in place but also activate the mini's Sleep/Wake functions. The cover also folds back into a neat little stand that will provide you with a more comfortable viewing or typing position. This makes gaming even more fun. It will also leave you hands-free to pursue other activities such as cell phone use, taking notes or grabbing a snack.